I was continuing to walk when I noticed a sound behind me. I looked behind me and saw a white van. I didn’t think anything if it, so I ignored it and kept walking. I kept walking and they pulled up next to me. And old lady stuck her head out of the passenger window and she looked so adorable. “Excuse me sonny, can you give me directions?” She asked with a smile. “Yeah sure, you have to just go down this road until you reach Mososagi Blvd. Then……..” I never finished because everything went black. I awoke with a raging headache. I tried to walk but found my legs bound to a wall. I tried to move my arms and found that they too were chained to the wall. I tried to charge up and break them, but couldn’t gather enough energy to break free. I then noticed the Ki blockers on my wrists and then realized I couldn’t escape. “Experimenting?” I asked in sort of a yelp. It won’t be anything to alter your physical appearance, since you have such a cute face” the voice repeated. “What are you going to do?” I asked afraid of what they were experimenting with. “Just some brain stimulants” it said with a little snicker. I gulped in fear. Where was the saiyans when one of their own was in trouble? I felt like my son was in trouble. But how could a saiyan be in trouble now? We’ve drafted all the ‘major’ villains and Goten could handle the rest if he was sick. But I couldn’t shake this feeling that something was wrong. “Honey, come back to bed” I heard from behind me. “Be right there” I said walking over to our bed. Whatever I was feeling must have just been my mind playing tricks on me. 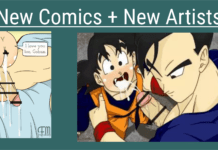 Previous article[Coming soon] – Oravlex’s “Fixing Gohan’s Suit” in COLOR and English!